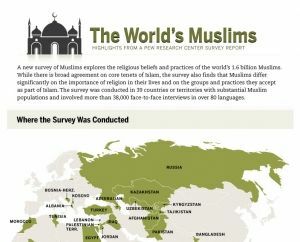 A major survey completed in 2012 by the Pew Research Center reveals global Muslim opinion on a wide variety of topics ranging from Sharia law, religious freedom, extremism, women, and modern society. While violence has historically pervaded religions from all over the globe, since 2002 Americans have been generally split over the idea of whether Islam is more likely than other religions to encourage violence. The diverse American Muslim population is most worried about the affects of negative stereotypes about them. At the same time American Muslims are happier with their lives and far more satisfied with the progress of the country than the general population. Highlights from a major survey completed in 2012 by the Pew Research Center shows that the world’s 1.6 billion Muslims broadly agree on the core tenants of the Islamic faith, but differ significantly in opinions about what groups and practices are a part of Islam. Islam requires five Articles of Faith which are: a declaration of faith, five daily prayers, charity, fasting in the month of Ramadan, and pilgrimage to Makkah. The Berkley Center for Religion, Peace, and World Affairs has found that Millenials are generally split on whether the values of Islam are at odds with the American way of life, but the majority believe that muslims should be allowed to build an Islamic center or mosque in their local community.